This article looks at the numerological influences at work in the choice of the 8th day of the 8th month, 2008 for the opening of the Beijing Olympics. Lyn lives in Adelaide, South Australia. The 29th Olympic Games open in Beijing, China at 8:08 pm on 8/8/08. The eighth day of the eighth month of the eighth year is deemed highly auspicious by the Chinese. It's not exactly rational, it's more like, um... occult! Lyn Busuttil, our resident expert on numerology, discusses the meanings of the number 8 and how it applies to this rare day. In numerology, we can break down any complex number, or name (the letters have numerical values) by adding them together, until we get the basic vibration. Numerology deals primarily with the numbers 1 through 9, though the Master Numbers, 11, 22, 33, and 44 get special attention. The number '8' represents the union of many – and how it is to be attained (the opening of the Olympics). Interestingly, CHINA is a number '8' – a power-country which at times has been aggressive, as opposed to TIBET, a number '2' country which strives for peace and harmony. Financial and business matters rule the number '8', so be sure to sort out your finances, pay your bills and reconcile your cheque book. Business matters may thrive, and if you need help or advice a visit to your accountant or financial advisor is recommended today. Are your taxes up to date? This is a good day to complete your tax return. Intuition is high today, so use it to quietly to observe others for a while and try to figure out their underlying motives. Be cautious of authority figures today such as the police, speed cameras etc. Avoid aggressive behaviour, whether your own or that of others. '8' is the dual number of infinity. The '8' assumes power for it likes to achieve control. The number '8' Mastery card in the Numbers Work cards indicates "acknowledgement of one's achievements". Set realistic goals and work steadily to achieve these – as you are no longer the beginner or initiate. So there we have a quick breakdown of the numerology of 8 – and of the rare moment in time that is the opening of the Beijing Olympics on 8/8/08 at 8:08 pm! We have set up a system on our sister site TruthStar.com that gives free on line access to many of these interpretations. To check out your own Personal Numerology, Soul Urge, Life Path and so on, or to get a free glimpse of your Personal Year Ahead, please click here. On the other hand, a computerized reading is not really personal enough, so Lyn can provide individual readings for you, right here on Astrology on the Web, at reasonable prices. Click Here to order your Personal Numerology Reading. Lyn has also published Barbara Alison's new Numbers Work! 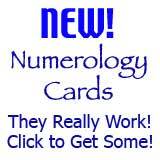 Numerology Cards, which are proving to be popular and intuitive, ideal for numerology readings. Like the Tarot Cards, these easy-to-use Numbers Work! Numerology Cards are valuable both for divination and personal growth. Why not visit Lyn's new site, Numbers Work!